The only thing I remembered from a visit eight years ago to the Krishnapura chhatris in Indore was the sandstone figures. I wrote about the chhatris yesterday, and I wanted to show you these memorable figures today. 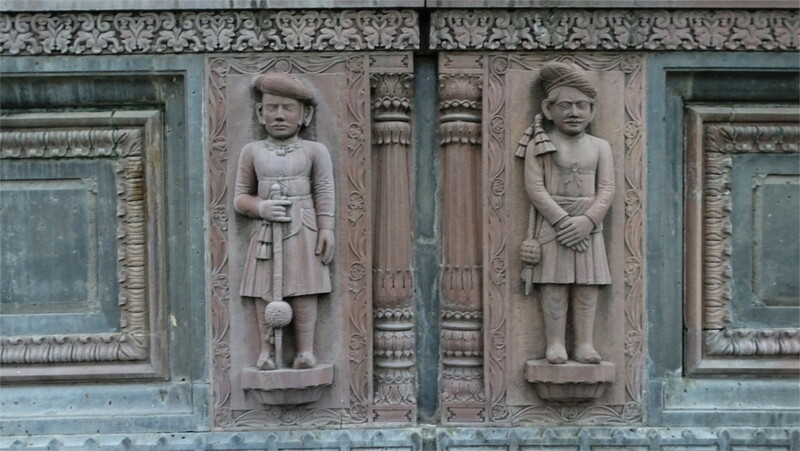 The featured photo shows the beautiful contrast of the red sandstone figures and the dark slate on which they are placed. The two panels above show the range of activities which is depicted in these figures. 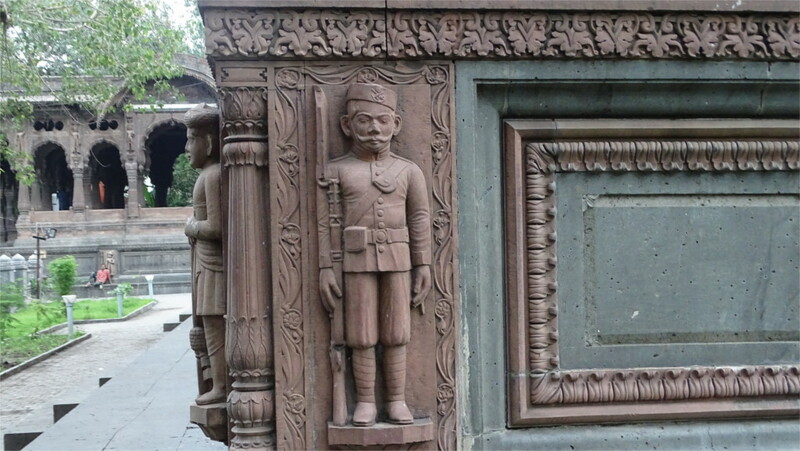 I’d remembered the soldiers around the base of the chhatris. Maybe I hadn’t looked up on my earlier visit, but this time I did not miss the figures of musicians, scribes and ascetics which decorate the upper parts of external pillars. You can see a musician and a soldier in the photos above. A psychopomp is a person who guards you in afterlife. Typically one thinks of such a character as a spirit guide. Since scribes and scholars, musicians and ascetics can guard rulers against falling into error, the collection of figures here are psychopomps for the dead rulers. In the photo above they guard the steps which lead up to the platform where the pyres of the kings were lit. The two figures in the photo above are clearly court functionaries. There were very few courtiers here. Although the lives of the royals would have been hemmed in by such people, their presence is measured. I liked the balance that the design has between different walks of life. These are memorials to rulers in settled times; this shows in the choice of professions and the weight given to each. The figure in the photo above is clearly from the early 20th century CE. The musket with a bayonet and utility pouches in various belts are clearly modern. But there is an air of dressiness in the breeches and leggings, and the non-utilitarian headgear, which speaks of the late 19th and early 20th centuries. I don’t know the exact date on which this chhatri was completed, although it could not have started before 1908, when Shivaji Rao Holkar, who is memorialized here, died. 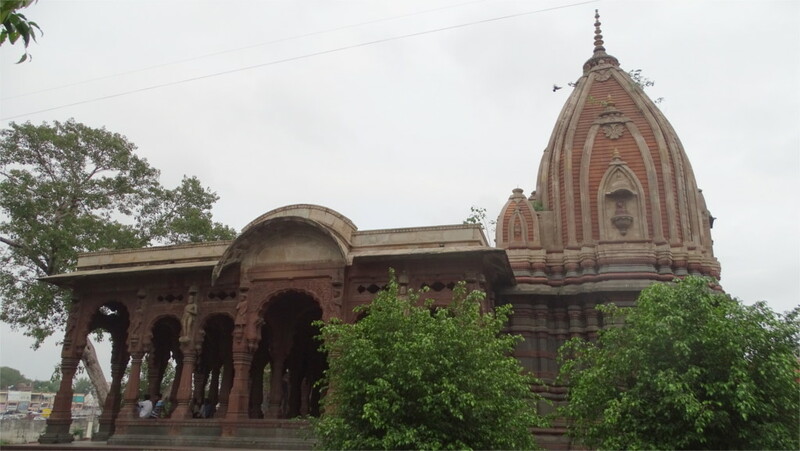 Very likely the chhatri was completed before the start of the first world war. This soldier would have been a contemporary figure. On our earlier visit to Indore we’d hurried through the chhatris, but they left little impression on me; just a vague memory of small terracotta soldiers. I wonder whether it was the lack of time, or the fact that before their restoration they were not very easy to access that blanked out my memory. The chhatris stand close to the rajwada and right on the Saraswati river. The town and the river have been cleaned up, so the ambience may be closer to what it was when the funeral pyres of the old rulers were lit, and the chhatris erected over the ashes. The oldest chhatri is the westernmost (photo above) and commemorates the death in 1849 of Krishanbai Holkar. The larger structure (featured photo) is a double chhatri, the western end in memory of Tukoji Rao Holkar II who died in 1886, and the eastern part of the cenotaph for his son and successor, Shivaji Rao Holkar who lived till 1908. It was pretty late in the day when we arrived, and the weak sun was close to setting. 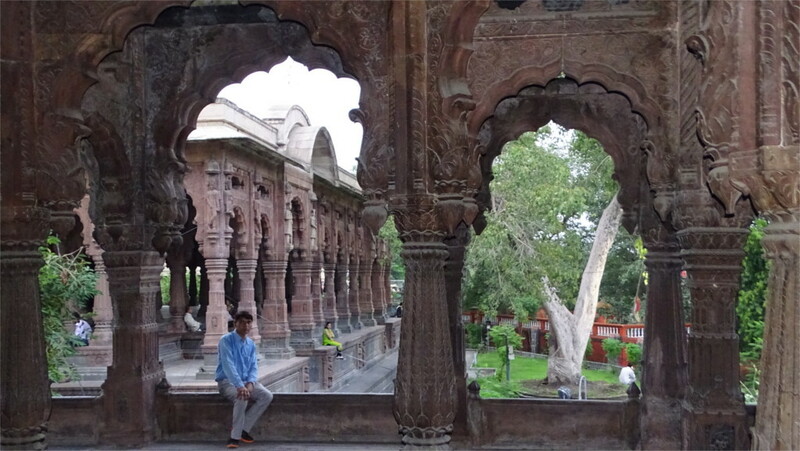 In spite of this, the spires of the chhatris looked very colourful: a dark slate, red sandstone, and white marble. There is also a smaller and more plain marble cenotaph raised on 1954 to the sister of the last king. 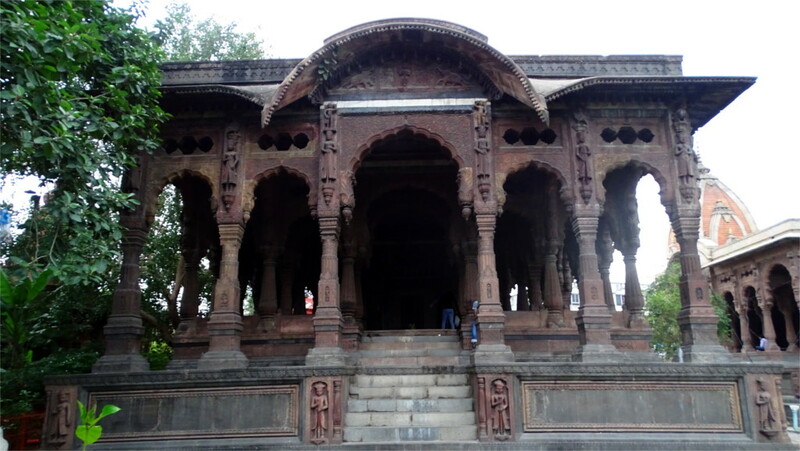 Funerals are traditionally performed next to a river, and this place close to Indore’s rajwada is an obvious location for the memorials. Unfortunately, that means that one has to look at the spires from very close, so foreshortening the view, or to walk across the river to get a perspective. Unfortunately, it was too long a walk, and it would be too dark by the time we got to the other side. 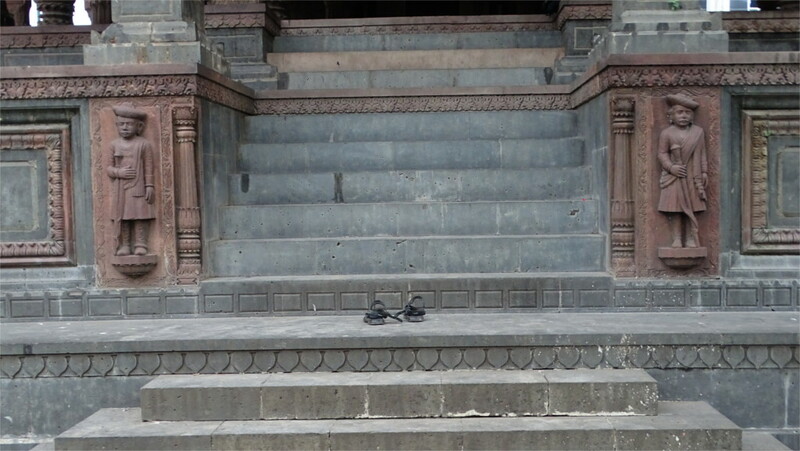 I climbed the steps up to the platform of Rani Krishnabai’s memorial. As you can see from the photo above, the elaborate roof and pillars are largely made of sandstone. I am certain that this is hard to maintain in the traffic fumes of the busy neighbourhood. On the base and pillars you can see the terracotta molded figures which I will describe in a later post. The pillars on the platform are stunning in detail. There was a minor fashion shoot on even at this late hour, and I pirated their lights to get shots of the details of the stone work. This oldest memorial has the most elaborate carvings, and I wished I’d climbed into this first. The light was really low now, and I only had harsh artificial lights to work with. There is a sense of calm here which many locals wander in to enjoy. Once you are inside it is easy to forget the mad traffic whirling past just outside the small compound. I seem to have startled such a person from his rest by trying to take a photo of the double cenotaph from inside the queen’s memorial. The cores of the cenotaphs are guarded by doors. The remains of the queen’s pyre lay behind the finely carved marble screen which you see above. The other door, guarded by a Nandi and flanked by two statues, stands outside the remains of Shivaji Rao. One of the two statues is a representation of the king. 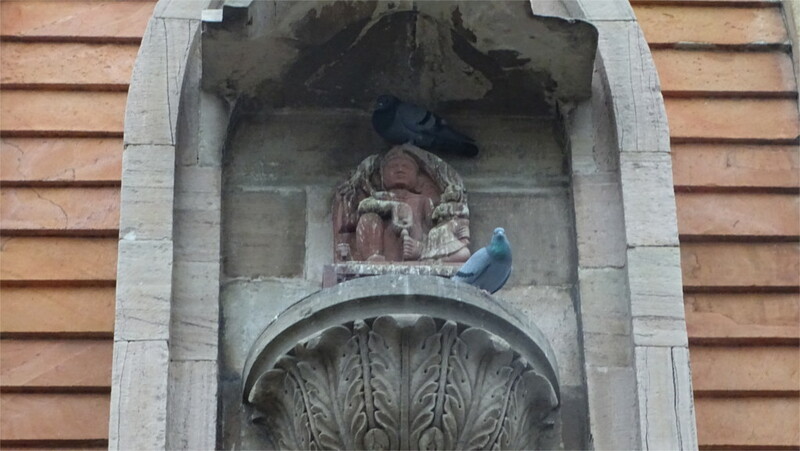 No large monument in a city is complete without blue rock pigeons. I spotted two of them here. The one half hidden in the darkness above the head of the statue seems to be a little bit of a giant. Lalbagh must be one of the more common names a palace or garden, although perhaps not quite as popular as a Mahatma Gandhi Road. When I read about the late 19th century palace built by the Holkars of Indore the associations that popped into my mind were in Mumbai and Bengaluru. A search immediately threw up many more red gardens. With a couple of hours to kill before our flight, I quickly looked at the small list of places we had not yet seen in Indore. The choice was between a 20th century temple, a mid-19th century mosque and this palace. We chose the palace; unfortunately. The Holkars have moved out of this sprawling building, leaving behind a few chandeliers and bulky pieces of furniture for tourists to gape at. You can pay 20 rupees for the pleasure of walking through nearly empty rooms. The mosaic floors and high ceilings are of some interest if you like late 19th century architecture, but the emptiness told on us. We escaped quickly to the desultorily maintained gardens. Clearly the locals make good use of the huge spaces. We came across lovers, cricket teams and people having a nap. We came to patches of lilies which were over-running their borders, but since they were all in bloom I guess the gardeners forgive them their audacity. We were at the airport early. We found ourselves walking between the chhatris and rajwada of Indore at dusk on a Saturday. I love markets at this time. 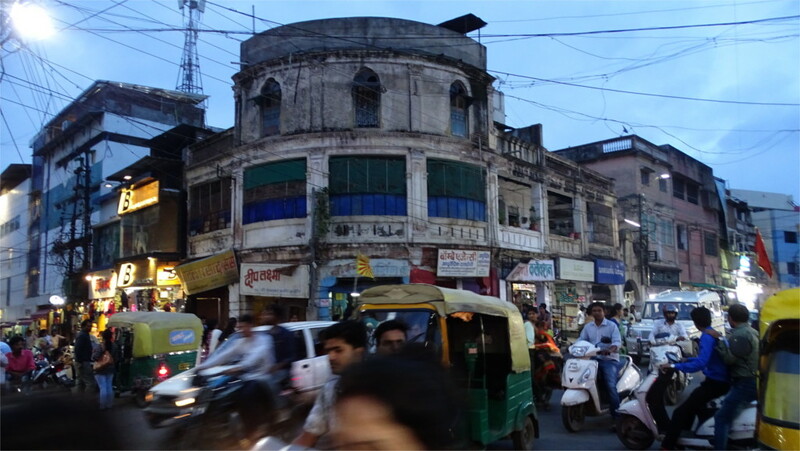 The monsoon sky was a beautiful shade of blue, and the lights of the markets were coming on. For a few moments the earth and sky are nearly balanced in terms of light. Looking down a road I could see the Bhumija spires of the chhatris against the century old once-grand buildings of the bazaar. Some of these are in really dire need of repairs, but it is easier to replace them by prefab frontages which attract many shoppers. Some downtowns have escaped this fate, and reached a stage where renovated old buildings are newly fashionable. I hope this part of Indore is not entirely replaced by these cheap 21st century structures. The mixed traffic was very heavy. The crowds made walking difficult. It was okay with me. I could pause and look at the mansions which may (or may not) become grand again. This lovely building from the early 20th century CE is something that I hope can be saved. I liked the clutter in the sky matching the crowds on the road. We walked slowly past to a rajwada closed for repairs. The gardens of Lalbagh Palace, Indore are now open to the public. On Sundays it is full of people relaxing. Walking about Ujjain’s Jantar Mantar I was expounding boring theories about the resurgence of medieval astronomy in early modern India when I heard the harsh call of a peacock. The Family clearly found this call electrifying. She broke off towards the tree where the call was coming from. The bird wasn’t hard to spot. It was sitting right there in the shadow below the canopy and calling loudly. It looked down its beak at us for a while, like the villainous Shen from one of the Kung Fu Panda movies. 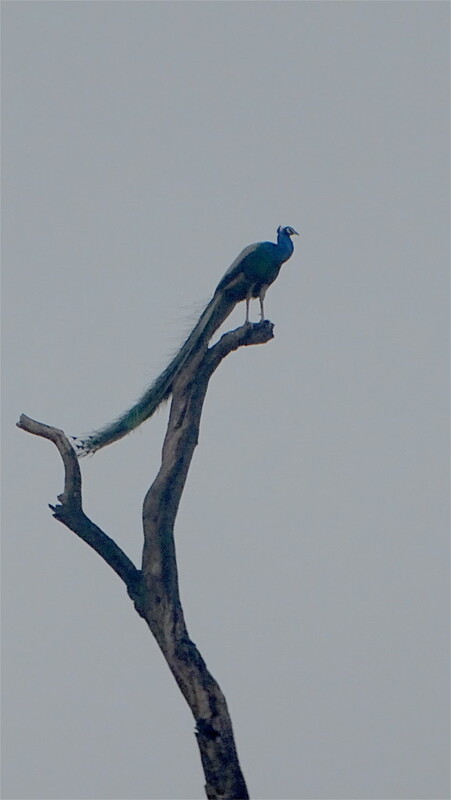 Peacocks must be terribly common in Malwa. Just the day before, I’d seen one perched on top of a dead tree next to the highway, doing nothing except looking faintly ridiculous. I find them fascinating when they walk about on the ground. When one is up on a tree its exaggerated train looks exactly like out-of-control clothes on a dandy. When all other pheasants I know of are shy creatures, who run away at the sight of humans, I wonder why the peafowl is so indifferent to us. In fact, when you browse the IUCN Red List you find that most pheasants are endangered due to loss of habitat, but not the peafowl. It has adapted to humans. It cannot be an accident that the peafowl is most closely related to turkeys, another species which has adapted to humans. I haven’t found detailed studies of this adaptation, but one of the most important reasons must be that they do not eat crops, and therefore are not considered to be pests. Are they also able to use the disturbed landscape efficiently to forage in? I’ve seen them in gardens and forests. Are they generalists in terms of utilizing landscape for breeding? I haven’t come across answers to questions like this. Perhaps there are studies but they are hard to find. 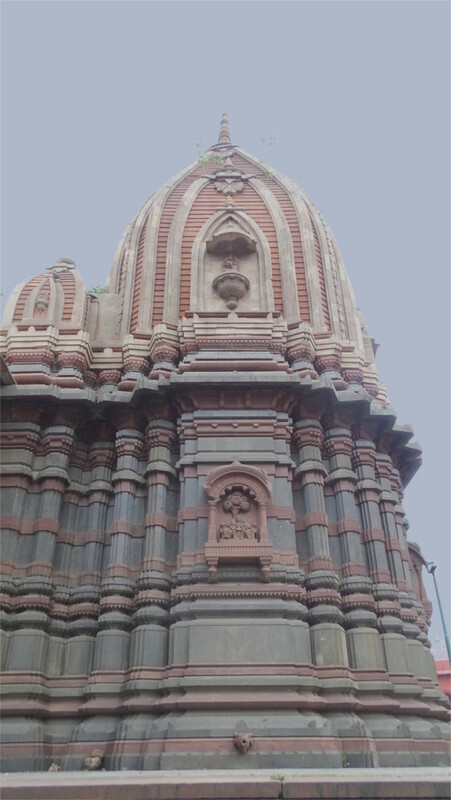 Mahakaleshwar is the main temple of Ujjain, dedicated to Shiva in his aspect of the Lord of Time. The temple is mentioned in the Skanda Purana, which dates from the 7th century CE. A version of the temple was destroyed by Iltutmish, Sultan of Delhi, when he sacked Ujjain in 1235 CE. 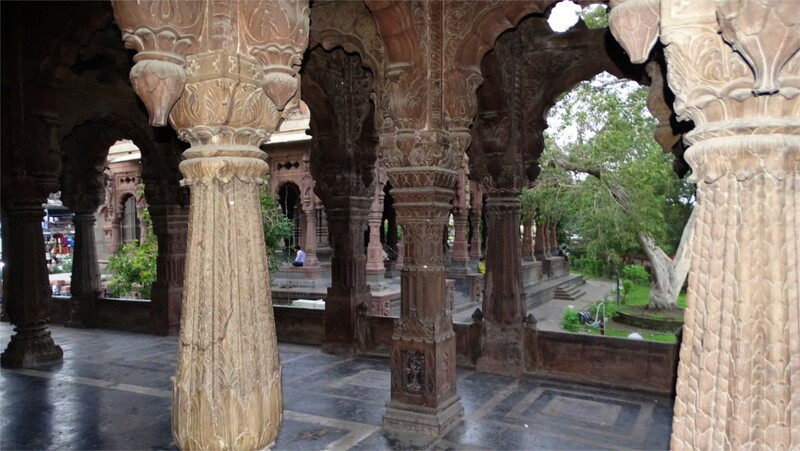 The present structure was built in 1736 CE by the Maratha chief Ranoji Shinde. It is one of the few jyotirlingas in which photography is forbidden. I was disappointed, because a few months before I’d taken photos of the beautiful Paramara era sculptures in the nearby jyotirlinga of Omkareshwar. The Family and I had a tea in the surprisingly quiet interior of a restaurant on the bustling street in front of the temple. “Do you mind if I get my camera?” I asked her. She said, “It’s a busy little street. Lots of photos to be taken.” We walked back to the parking lot and got my camera. The street food looked good. As I took a few photos, a courteous middle-aged gentleman came up to me and opened conversation. “The poha that Indore claims is actually from Ujjain,” he told me; “Try it here and compare.” I promised to do that. He was a fount of information about small local things. He asked me whether I needed a guide. I declined, and he continued the conversation. My opinion of Ujjain went up after talking to him. This was a wonderfully civilized way to offer a guide’s services. The conversation showed me how the lords of time must laugh at us. The poha was Ujjain’s, now it is Indore’s. We eat food which we think is traditional, and will last for ever, without noticing how fast it changes. An Oxford Don writing a story notionally set in a fictional early European universe constructed fictitious languages and a cosmic mythology with great scholarship, but had his characters eat “taters” and tomatoes, and smoke tobacco. None of these could have been seen in Europe before the end of the 15th century CE. We really pay little attention to food and its history. There was a short break in the rain when we reached Kalabhairava temple. Bhairava are the destructive aspects of Shiva, and Kalabhairava is one which is supposed to bring about the end of time. This has crossed over to the Tantric Buddhist tradition in various forms, including the Yamantaka, who is supposed to bring about the end of death, through the ending of time. There was already a temple to Kalabhairava at this site when, in the late 18th century CE, the Maratha chieftain Mahadaji Shinde came to pray for success in battle. After winning the battle, now known as the third battle of Panipat, he replaced the old temple by a new one in 1775 CE. The entrance gate is a typical late Maratha structure. I’d hoped to walk around the temple looking for the remnants of the older Paramara era frescos and the remnants of the old statues of that time. Unfortunately, there were too many restrictions on what was possible, and we gave up on that utopian idea. The Family noticed something which had escaped me. “Do you see that there are no women here?” she asked. Indeed, now that she had pointed it out, I did. The probable reason is that the standard offering to the Kalabhairava of Ujjain is alcohol. Across the parking area in front of the gate was a line of shops selling things needed in the rituals of the temple. If you examine the photo above, you can see baskets with a ready made kit of all that you need. Nestled among the flowers is a bottle of alcohol. Near the foot of the attendant is the empty cardboard carton in which these bottles had been packed. I couldn’t trace the origins of this custom: could it be due to the Marathas, or is it older? 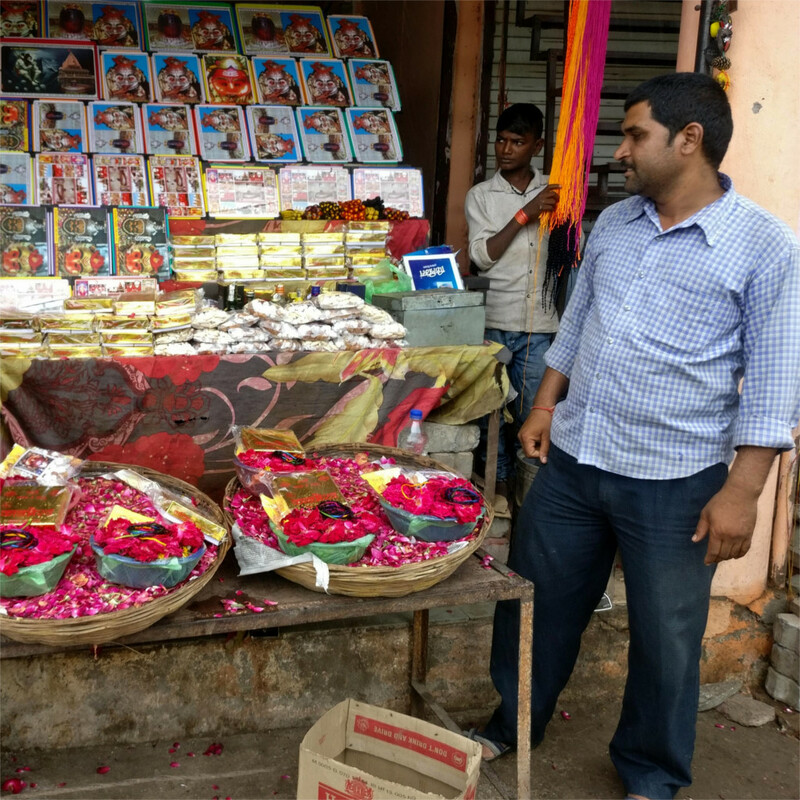 We walked up to Ram ghat past a signboard saying “Balmukund Ashram”, through a lane, on one side which were stalls selling religious parapharnelia, and with a tall Maratha-era dharamshala on the other. My imagination of ghats is dominated by those of Banaras, and I was certainly not expecting the sight that met my eyes. 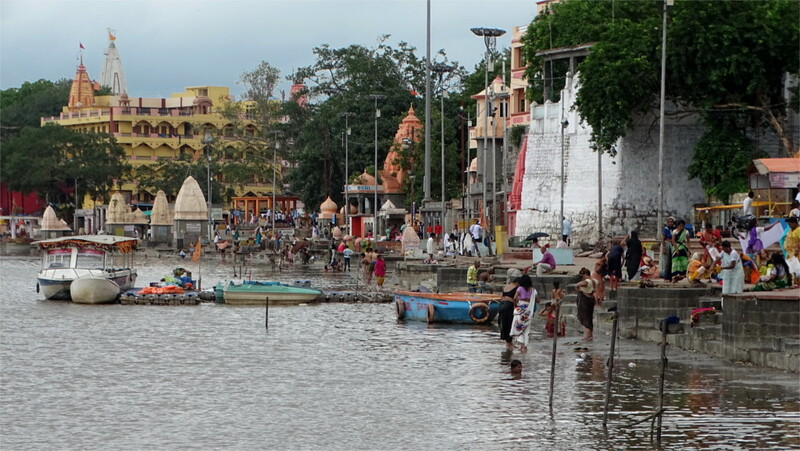 Ujjain’s Ram ghat is more subdued, people come here in the normal course of their lives. There are many priests waiting for custom, but the commercial bustle of Banaras is not to be seen. The featured photo shows such a priest, quite relaxed in his silk kurta, but keeping an eye out for custom. I walked out on the pedestrian bridge connecting to Narsingh ghat on the far side of the Kshipra river, the better to take a photo of Ram ghat. All ghats are made in the form of steps parallel to the flow of the river. In the middle of the monsoon, the river was quite high: about five or six steps led down from the promenade to the river. On the landward side of the promenade there are the main temples and their associated dharamshalas behind high walls. A couple of centuries ago they would have been the last barrier against flood waters. On the river side are smaller shrines, each with its own priests. There were many bathers here, including several extended families. It is hard to imagine the crowds that come here for the Simhastha Kumbh Mela. 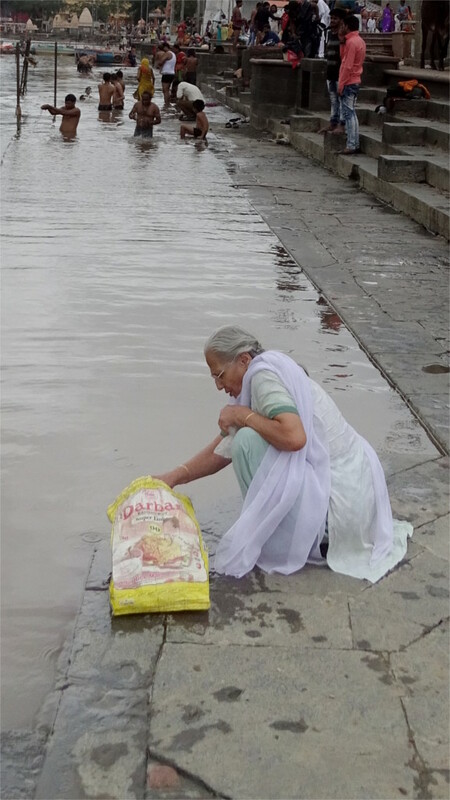 The lady whom you see in the photo above had a bagful of bottles which she was filling one by one with the waters of the Kshipra. It is considered to be a holy river after all. Her lightly coloured salwar and kameez, with the white dupatta, perhaps means that she is a traditional widow. If so, a trip to a holy river is one of the few outings that she will treat herself to. She filled many bottles as I watched. I guess most will go to members of an extended family. Some perhaps will also be given to her neighbours. 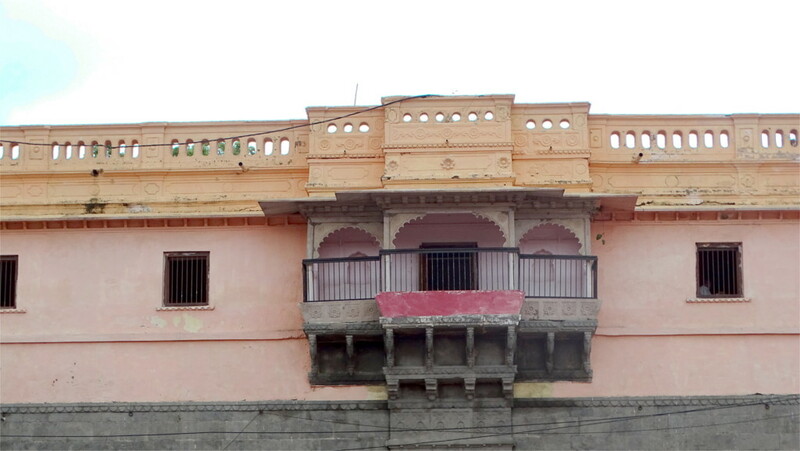 The Maratha era building which you can see in the photo above dominated this portion of the ghats. It is hard to imagine that the pleasant Ram ghat I saw is the site of a Kumbh Mela held every 12 years (the next one is in 2028). The state transport ministry claims that 75 million people visited Ujjain’s Kumbh Mela in 2016. Even if the number were smaller, it would be a major feat of crowd control. In fact, if one searches for scientific papers on the Kumbh mela, one is overwhelmed by the number of studies of crowd behaviour, biohazard, and other safety issues. I used to wonder about the origin of the Kumbh mela in Ujjain. Kalidasa’s poem Meghdoot, from the 5th century CE, talks of Ujjain but not the Kumbh mela. Maratha sources from the 18th century CE ascribe the beginning of the mela at Ujjain to Ranoji Shinde. Since he was one of the main commanders of the Maratha forces which won Malwa, and he declared Ujjain to be his capital, this is not an unlikely history. It is possible though that many of temples here had their own melas, which they combined into a single mela at the urging of Ranoji. It has grown significantly since then.